Iowahawk is a blogger who is deservedly famous for political satire, as you can see from this video on the new Government Motors car named after Nancy Pelosi. 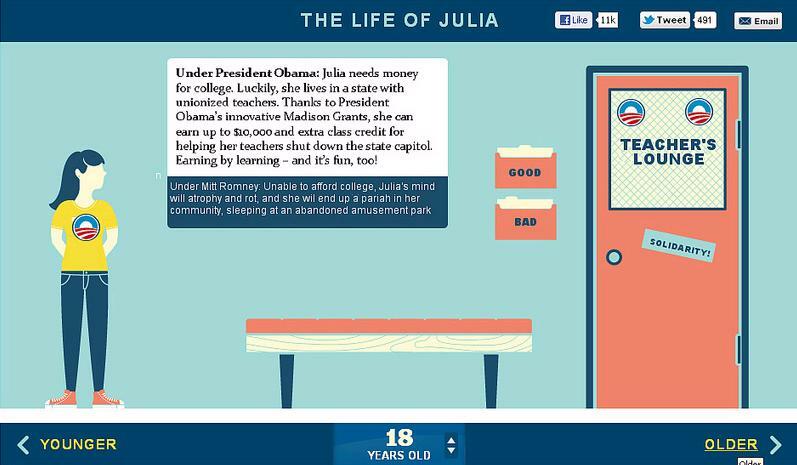 Well, he’s at it again, with a parody of Julia, the über-moocher created by the Obama campaign. The whole set is here, and I’ve copied one image below for your enjoyment. I think you’ll find the whole thing very amusing. Assuming, of course, you don’t think about the consequences of more and more Americans deciding it is okay to mooch and loot their way through life. Just in case you’re a frog sitting in a pot full of warming water on the stove and haven’t noticed… THIS IS WHAT SOCIALISM LOOKS LIKE. The loss of national and personal virtue, being overtaken by selfish, materialistic moral decadence, coupled with a disdain for an education founded in an understanding of history mathematics and language skills has created an entire generation of ignorant, less-than-patriotic sponges well-skilled at taking advantage of government largess craftily labeled as progressivism by the socialist plantation owners. We’ll give you everything you need if you are willing to accept less than you are required to risk and work for. Your price is the chains you willingly wear without shame. Julia was the name of the female in 1984. Big Brother could not control her sexuality, so they had problems with Winston. It’s a first for us all & more are seeing it all the time. O is the face of the decline and fall of America. There are quite a few who will back him in hopes of this agenda, but hopefully & prayerfully, they won’t make it reality. There has never been an election where I thought electing one particular man meant the abrogation of my adult life, or where I thought that abrogation meant “help”. This is not the thinking of a free people.